In the Netherlands, the general rules of civil law relating to the governance of companies and listed companies are laid down in Book 2 of the Dutch Civil Code (DCC). This sets out the duties and powers of the various corporate bodies, as well as rules on representation, conflicts of interest and the liability of management board members. The DCC also contains rules regarding financial reporting and disclosure. Compliance with the rules in the DCC can, if necessary, be forced through the courts. In this context, it should be mentioned that a right of inquiry was introduced in Book 2 of the DCC in 1994: shareholders with a specific capital interest (in some cases even former shareholders)2 may request a court specially designated for this purpose – the Enterprise Chamber of the Amsterdam Court of Appeal – to initiate an inquiry into the company’s policy and affairs. Upon a showing of mismanagement, the Enterprise Chamber can intervene by, inter alia, suspending or nullifying a management board decision, suspending or removing management or supervisory board members and appointing temporary board members. In practice, inquiry proceedings have played an important role in the development of law in the area of corporate governance; for example, with regard to the issue of the respective roles of the management board and the shareholders in determining the strategy of the relevant company. In addition, the Netherlands has rules on the supervision of the business conduct of listed companies, laid down in Chapter 5 of the Financial Supervision Act (FSA). The FSA contains rules on, inter alia, the disclosure of major holdings, financial reporting, the prevention of market abuse and the obligations of institutional investors. Supervision of compliance with these rules is carried out by a specially designated body, the Authority for the Financial Markets (AFM). Alongside these statutory rules, there is a system of self-regulation consisting of codes of conduct containing principles and best-practice provisions drawn up by the sector itself. The first Dutch Corporate Governance Code containing governance rules for listed companies entered into effect in 2004. In December 2016, a revised version (the Corporate Governance Code) was published, with more attention being paid to long-term value creation, culture, reporting of misconduct, risk management and how to apply the Corporate Governance Code in a company with a one-tier board. Since the introduction of the first Corporate Governance Code, several sectors have set up their own specific codes, such as the Code of the Dutch Pension Funds and the Housing Corporations Code. In 2010, the Banking Code was introduced to govern Dutch banks. This mirrors the Corporate Governance Code in many respects, but also contains rules specifically targeted at banks (specific expertise of certain committee or board members, the treatment and interests of clients). The Banking Code applies to both listed and unlisted banks. In January 2015, the Banking Code was updated. Listed banks fall under the Corporate Governance Code, as well as the Banking Code. Both codes adopt a ‘comply or explain’ system: on their websites companies must state how they applied the principles and best-practice provisions and, if applicable, provide a reasoned explanation of why a provision has not been applied. For both codes, there is a separate monitoring committee that annually reports on the extent to which each code has been complied with, and on any problem areas that have emerged in this regard. In October 2017, the new Dutch government presented several intended legislative changes as part of its coalition agreement. One of the announced measures relates to the protection of businesses (in general, as well as in specific vital sectors). At present, there are two lines of discussion on additional scrutiny of and protection against hostile or risky takeovers. The first was prompted by the 2013 threatened takeover of KPN, which raised the question as to whether companies operating in vital sectors in the Netherlands ought not to be better protected. The second discussion arose in the wake of the threatened takeovers of AkzoNobel and Unilever in 2017 and focuses primarily on improved protection against hostile takeovers and improper shareholder activism in Dutch listed companies in general. The coalition agreement sets out proposals with regard to both subjects: after careful analysis of the risks to national security, selected companies working in vital sectors will only be eligible for takeover following explicit approval (subject to conditions if necessary) or will be protected by means of other suitable guarantees. It will also be investigated whether such protection is likewise necessary for agricultural land and certain regional infrastructure works, in addition to the current list of vital sectors. In December 2017, the Minister of Economic Affairs and Climate Policy announced that analyses should be completed in the first quarter of 2018. In addition, the coalition agreement states that in order to shift influence from certain activist shareholders with a primarily short-term outlook to shareholders and other stakeholders who are interested in creating long-term value, a listed company that faces proposals during a general meeting of shareholders for a fundamental change of strategy will be able to invoke a response time (a time-out) of up to 250 days, provided capital transactions are not affected. This last requirement, which is intended to avoid violating EU law, means that the time-out cannot be invoked during a hostile takeover situation, as was proposed by the previous government. However, in a later letter to Parliament the minister indicated that this time-out could indeed also be invoked in the event of a takeover bid. Furthermore, listed companies with an annual turnover of more than €750 million will be given the opportunity to ask shareholders that own more than 1 per cent of the share capital to register as major shareholders with the AFM. In December 2017, the minister announced that a draft bill regarding the protection of businesses against hostile or risky takeovers is to be expected in the first quarter of 2018. 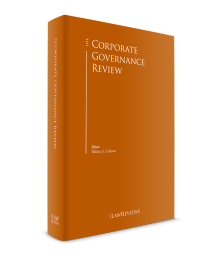 On 8 December 2016 the Dutch Corporate Governance Code Monitoring Committee published the revised Corporate Governance Code. The new Code is effective from 1 January 2017, so management reports for the year 2017 have to comply with its provisions. On a closer look, some provisions need clarification. For instance, it is not evident if the Code requires a separate explanation for each best practice on how the company did or did not comply, or how the code should be applied for a company with a one-tier board. Furthermore, a couple of requirements are unclear, such as the requirements for: the selection and appointment of board members, the succession plan, the diversity policy, the independence rules and the the report of the internal auditor to the Audit Committee. Other provisions raise more practical questions, such as how: (1) to involve the supervisory board in formulating the company’s strategy; (2) the supervisory board should supervise the management board with regard to culture; (3) an individual management board member should give his or her view on his or her own remuneration; and (4) the management board should ‘ensure that internal procedures are established and maintained, which safeguard that all relevant information is known to the management board and the supervisory board in a timely fashion’. Despite these issues, the first experiences with the new Code are overall considered to be positive and in line with the present spirit of time. In December 2017, the Institute for Governance and Organisational Responsibility published its assessment report on the Management and Supervision Act of 2012. The research was concentrated on three subjects: (1) the one-tier board structure; (2) the limitation of the number of positions of a management or supervisory board member; and (3) the target of 30 per cent minimum participation of women in management or supervisory boards. A relevant observation in respect to the one-tier board structure is that banks and insurance companies cannot opt for a one-tier board structure without adequate justification. They advise to change the current law under which these companies have to establish a separate supervisory board. The study also showed that although in general the one-tier board structure operates as intended, the rule stating that the chair needs to be a non-executive is not always complied with. However, the researchers see no need to amend the rules. Regarding the subject of limiting the amount of supervisory or managing positions, see Section II.ii. Finally, the study concludes that the provision regarding the target of 30 per cent minimum participation of women in boards is unclear in several aspects. Therefore, the Minister of Security and Justice is advised to clarify the information on a dedicated website. Furthermore, the researchers advise expanding the provision to large foundations, cooperatives and mutual insurance associations and to give the works council the right to address the general meeting of shareholders regarding this subject. In line with the Fourth and Fifth Anti-Money Laundering Directives, which require Member States to implement and maintain a register of ultimate beneficial owners of all Dutch entities except listed companies as of June 2017, the Dutch government held a public consultation in 2017 regarding a modification of bearer shares to make it possible to trace the identity of the shareholder. The proposal alters the shares to book-entry form only and imposes deposit and registration requirements. With regard to the implementation of the mandatory register of beneficial owners, the Netherlands is one of the many countries that has not met the deadline of June 2017. The Dutch government has announced it will have the register operational by the summer of 2018. In short, the subject of corporate governance remains high on the agenda in the Netherlands. Overall, an actual change in culture and behaviour is expected of companies generally and of the banking sector in particular, with legislative action being taken where self-regulation fails to deliver the desired result. it regularly employs at least 100 employees in the Netherlands. Since 2013, Dutch corporate law has also provided a statutory basis for the one-tier board structure. However, through the influence of international developments, the one-tier board structure had made its way into Dutch corporate practice prior to this legislation. Therefore, the Corporate Governance Code of 2008 already contained provisions relating to listed companies with a one-tier board structure. In 2016, the new Code clarified how companies with a one-tier board must apply the Code by, inter alia, specifying that the current rules for supervisory board members also apply to non-executive directors. The management board is charged by law with the duty to manage the company, subject to restrictions imposed in the articles of association.6 It is generally accepted that management in any event includes directing the company’s day-to-day affairs and setting out its strategy. It should be borne in mind that in accordance with the Dutch stakeholder model, the board must take into account various interests, not only those of the enterprise and shareholders, but also those of other interested parties, such as employees and creditors. In recent years the average size of the boards of Dutch listed companies has declined; a significant number of companies even have two-member boards. The rise of this ‘CEO–CFO model’ can be explained by a number of factors, one of which is the popularity of the executive committee (Exco), in which board members as well as senior managers have seats; in these setups a larger management board makes less sense. Although clearly desirable in terms of efficiency, Excos also raise several governance issues that require due consideration. The new Corporate Governance Code Committee does embrace the Exco; however, it requires companies to render account of governance issues such as how the interaction between the Exco and the supervisory board will be structured. Furthermore, the Exco’s role, duties and composition must be set out in the management report. The function of the supervisory board is to supervise and advise the management board and oversee the general state of affairs within the company.7 Like the management board, the supervisory board must take into account the interests of the company and its enterprise, as well as those of all other stakeholders. To enable the supervisory board to perform its supervisory duties, the DCC requires the management board to provide the supervisory board at least once a year with information about the company’s strategic policy, its general and financial risks and its internal control system. The Corporate Governance Code expands upon the supervisory duties: if the supervisory board consists of more than four members, it must appoint from among its members an audit committee,9 a remuneration committee and a selection and appointment committee, whose duties are also specified. As previously stated, management board members of structure-regime companies are appointed and removed by the supervisory board. In companies not governed by this regime, the general meeting of shareholders has this power. Under the present Corporate Governance Code, management board members are in principle appointed for a maximum term of four years, but reappointment for successive four-year terms is permitted. With regard to their removal, it should be noted that management board members have both a corporate and an employment relationship with the company. For a long time, it was unclear whether the removal of a management board member by the supervisory board or general meeting of shareholders terminated both of these relationships, or only the corporate one. In a decision rendered in April 2005, however, the Supreme Court ruled that removal also terminates the employment relationship.10 Every management board member having been employed for two years or more, is entitled to claim a transition payment when the contract is (1) terminated by the employer, (2) dissolved in court at the employer’s request or (3) has ended by operation of law. Only in exceptional circumstances, such as in the event of any seriously culpable act or omission on the employer’s part, or other extraordinary circumstances, could the board member be eligible for additional severance pay, referred to as ‘fair compensation’. The DCC and the codes contain several provisions intended to safeguard the independence of supervisory board members, such as the absence of family ties and business interests.15 The Dutch Central Bank, in its capacity as regulator of banks and insurance companies attaches great value to the independence of supervisory board members for the purpose of good corporate governance, and in 2012 has, further to the provisions of the code, developed its own policy rules. It requires that supervisory board members are independent ‘in mind’ (independent with respect to partial interests), ‘in state’ (formal independence) and ‘in appearance’ (no conflicts of interest). In the Netherlands, no fewer than four different regimes apply governing maximum numbers of board positions held, depending on legal form and business activity. Notwithstanding these rules, overboarding is also under close scrutiny, by investors as well as regulators. The number of supervisory positions a management board member or supervisory board member is allowed to hold at large legal entities is limited by the DCC. In principle, a management board member may hold a maximum of two positions as a supervisory board member in addition to his or her management board position; for a supervisory board member the limit is a total of five supervisory positions, with a position as a management board or supervisory board chairman counting double. The purpose of this is not only to improve the quality of supervision, but also to eradicate the ‘old boys network’. In the aforementioned evaluation of the Act on Management and Supervision (see Section I. ii) researchers assessed among other things whether the cap for large entities in the DCC should be amended. They firstly concluded that the supervisory function has become more professional. And because only a very small group of people is forced to take on fewer positions while they could manage more, they see no need to alter the rules. However, with regard to the chair position, the researchers suggested that the cap of two could be lowered to 1.5, so a chair would be able to combine three chair positions. Over and above these measures to improve the quality of management and supervision, rules to promote gender diversity within the management boards and supervisory boards of large companies have applied in the Netherlands since 1 January 2013, the target being a division within the board of at least 30 per cent females and 30 per cent males. The rules are of a ‘comply or explain’ nature: if the target is not met this will not lead to the imposition of sanctions, but an explanation must be given in the management report as to why the target was not met and what steps will be taken towards meeting it. At the end of 2015 it was announced that these rules, which were originally meant to be abolished as of 1 January 2016, will be extended to 2019. In April 2017, the rules were formally adopted again. At EU level, negotiations are still ongoing between the European Parliament and the Council on a draft directive promoting gender diversity within the management of large listed companies.22 Pursuant to the draft directive, by 2020 at least 40 per cent of the non-executive directors of such companies must be women and heavy sanctions will apply in the event of non-compliance. However, there are strong objections on the part of a number of EU Member States, including the Netherlands, and it therefore remains to be seen in what form the directive will cross the finish line. Finally, narrower in scope but still relevant, EU Directive 2014/95 requires ‘large’ companies to have a description of the diversity policy applied in relation to the undertaking’s administrative, management and supervisory bodies.23 This Directive was implemented in Dutch law in December 2016 and entered into force on 1 January 2017.24 Diversity under this Directive has a wider significance than gender alone, but also includes, inter alia, background, expertise, nationality and experience. Under Dutch corporate law, the management of a company is in principle the responsibility of the board members collectively as well as of each board member individually. The company’s articles of association or internal rules may, to some extent, assign certain specific duties to individual board members, but the board as a whole remains responsible. The Management and Supervision Act, which has created a basis for the one-tier board model, expressly authorises the allocation of duties between one or more non-executive members and one or more executive members of a one-tier board. In this case, too, however, the board as a whole remains responsible for the company’s management, including the non-executive members (see below). The power to manage the company entails, inter alia, the power to represent it in transactions with third parties.25 Under the DCC, both the management board as a whole and each board member individually have this power. The articles of association may, however, limit or exclude the individual representative power of one or more board members. For example, the articles may provide that the company may only be represented by the board as a whole or by the chair and the financial director acting together. Neither a management board member nor a supervisory board member will be permitted to take part in any discussion or decision-making that involves a subject or transaction in relation to which he or she has a conflict of interest. The DCC provides subsequently that if the board member nevertheless does take part, he or she may be liable towards the company, but the transaction with the third party will in principle remain valid. A management board member who has performed his or her duties improperly may be held personally liable to the company. The same liability rules also apply to supervisory board members. In principle, each board member is liable for the company’s general affairs and for the entire damage resulting from mismanagement by any other board member (principle of collective responsibility). A board member may, however, avoid liability by proving that he or she cannot be blamed for the mismanagement. The allocation of duties between the board member and his or her fellow board members is one of the relevant factors in that respect. With respect to the one-tier board model, the explanatory memorandum to the Management and Supervision Act specifically states that an internal allocation of duties among the board members is permitted, but that this does not change the directors’ collective responsibility for the company’s management. The non-executive board members (i.e., those not charged with attending to the company’s day-to-day affairs) may therefore be held liable for the mismanagement of an executive board member. For that reason it is advisable that board members keep each other informed of their actions and actively inform each other, sometimes also referred to as a monitoring duty. The Supreme Court has held that only the company, or a bankruptcy trustee in cases of insolvency, may sue a board member for mismanagement under Article 2:9 of the DCC; there is no shareholder derivative action under Dutch law.27 However, in certain situations directors may incur personal liability as regards third parties, such as shareholders or creditors of the company on account of tort or on account of specific provisions in the law, such as in the case of insolvency caused by apparent mismanagement. As at early 2014, draft legislation has been drawn up with the aim of standardising the rules on the responsibilities of management board members and supervisory board members for all the different types of legal entities. This also applies to the rules on conflicts of interest and on liability. The new legislation will not result in any substantive changes for companies with a share capital. A draft bill was presented to parliament in 2016 and was expected to be implemented no later than July 2017. However, to date, the bill has not yet passed the lower house of parliament. Listed companies are subject to various disclosure obligations. The general rules on financial reporting can be found in Book 2 of the DCC, while the FSA contains additional rules applicable to listed companies. The Corporate Governance Code also lays down several specific financial disclosure obligations for listed companies. The DCC contains rules with regard to the composition of the annual accounts and management report, the auditor’s opinion (see below), the adoption of the annual accounts and the publication requirement. Listed companies are required to send their annual accounts to the AFM after adoption. If the AFM believes that annual accounts do not comply with the relevant rules, it may initiate special ‘annual accounts proceedings’ before the Enterprise Chamber of the Amsterdam Court of Appeal. Shareholders and employees may also initiate such proceedings. In these proceedings, the Court may order the company to amend the annual accounts and management report in accordance with its instructions. The transparency requirements can, in general terms, be divided into two categories: ad hoc disclosure obligations and periodic disclosure obligations. In addition, shareholders of listed companies are required to notify the AFM if their holdings of voting rights or capital in listed companies reach, exceed or fall below particular thresholds.34 Gross short positions in excess of a certain threshold (3 per cent) must also be disclosed; this obligation is intended to give an insight into the shareholder’s true economic interest and, at the same time, to shed light on ‘empty voting’.35 Moreover, since 1 January 2013 shareholders have been obliged to disclose the loss or acquisition of predominant control (30 per cent shareholding or voting rights), as a result of the mandatory bid regime arising from European legislation. The issuer is required to disclose certain information as well, such as changes in its issued capital or in the number of voting rights on its shares. Management and supervisory board members of listed companies are also required to notify the AFM of their holdings of shares or voting rights in the company and of any transactions in these shares or changes in the voting rights. With regard to the auditing of financial disclosure, there has been a new European development. This significant change entered into force with effect from 1 January 2017: statutory auditors are required to enact an extensive, supplementary control statement for the audit committee of the board of directors.36 This forms part of a shift in responsibilities to the audit committee. Audit committees have to explain how the audit contributed to the integrity of the financial reporting, what the audit committee’s role has been in the process, and bear responsibility for the selection procedure regarding the auditor. The Corporate Governance Code also contains provisions on the auditing of the financial reports and the position of the internal audit function and the external auditor. These provisions cover subjects such as the role, appointment, remuneration and assessment of the functioning of the external auditor, as well as the relationship and communication of the external auditor with the management board, supervisory board and audit committee. As from 1 January 2018, the revised Code is enshrined with the entering into force of the Decree on content of financial reports. This Decree also clarified the way the auditor has to check the corporate governance statement of the company’s financial reports. Instead of merely verifying the information is present, for years commencing on or after 1 January 2017, the auditor has to make sure the statement is consistent with the financial reports and does not contain any errors of material importance. The Netherlands has traditionally followed the stakeholder model, under which management and supervisory board members are required to take into account the interests of all stakeholders when making decisions and performing their duties. According to its preamble, the Corporate Governance Code is based on the principle that a company is a long-term alliance between the various parties involved in the company, such as employees, shareholders and other investors, suppliers, customers, the public sector and public interest groups. In the consultation for the new Code, the Corporate Governance Code Monitoring Committee explained that corporate social responsibility is not an isolated goal, but forms an integral part of the company strategy geared towards long-term value creation, which is a matter for the management board members and supervisory board members collectively. Next to the focus on carefully weighing up the interests of all stakeholders, this also includes a focus on non-financial issues that are relevant to the enterprise. This is also reflected in the ‘in-control’ statement, which concerns more than financial reporting risks. It is also in line with the current trend towards ‘integrated reporting’. This social undertone is not surprising given that the Corporate Governance Code was drawn up in response to accounting scandals in the United States and Europe, and was intended to restore confidence in management and the financial market parties. The Code, therefore, requires the management board to draw up a view and strategy on long-term value creation setting out, inter alia, any aspects relevant to the company, such as the environment, social and employee-related matters, the chain within which the enterprise operates, respect for human rights, and fighting corruption and bribery.37 The management board must engage the supervisory board early on in formulating the strategy. Thereafter, the supervisory board must supervise the manner in which the management board implements the long-term value creation strategy. A more detailed explanation of its view on long-term value creation and the strategy for its realisation, as well as describing which contributions were made to long-term value creation in the past financial year must be published in the management report. It should report on both the short-term and long-term developments. On an international level, large public-interest entities – in short: listed companies, banks and insurers – are required to include in their management reports a non-financial statement containing certain CSR-related information. We maintain that where socially responsible entrepreneurship initially appeared to be restricted to a small group of idealists, companies now seem to be increasingly aware of its importance also for commercial considerations. Not surprisingly, post-crisis governance reforms focus on risk management. In the revised 2015 BIS Corporate Governance Principles for banks this is evident, but these are part of a broader trend towards an increased focus on risk and risk governance within financial institutions. Risk governance is also one of the pillars of CRR/CRD IV, the European project that as at 1 January 2014 raised the Basel III agreements to the level of legislation. In October 2017 the Basel Committee on Banking Supervision published the Guidelines on identification and management of step-in risk, as part of the G20 initiative to strengthen the oversight and regulation of the shadow banking system to mitigate systemic risks, in particular risks arising because of banks’ interactions with shadow banking entities. In the Netherlands this subject is also prominent on the political and public agenda even apart from the implementation of the European rules just mentioned, as follows from the 2015 Dutch Banking Code. As a result of the financial crisis, risk management has also gained prominence in the Corporate Governance Code. Moreover, the new Code contains several best practices to further strengthen risk management and disclosure related to risk. The position of the internal auditor and the role of the audit committee regarding staffing, work plan and functioning of the internal auditor are strengthened. Furthermore, the chief financial officer, the internal auditor and the external auditor should attend the audit committee meetings, unless the audit committee determines otherwise. Regarding risk disclosure, the scope of the in-control statement is widened to the functioning of internal risk control in general (not only regarding financial reporting risks) and to require the management board to state that in the 12-month period ahead the continuity of the company is safeguarded. In practice, the Code also turns out to have a knock-on effect on other sectors. Often the rules of the Code are used by non-listed companies, serving as a model for codes of conduct in all sorts of sectors, including semi-public sectors such as healthcare and education. In addition, Article 2:391 of the DCC requires the management board to describe in the management report the main risks to which the enterprise is exposed. If necessary, to properly understand the results or position of the company and its group companies, the management report should also contain an analysis of both financial and non-financial performance indicators, including environmental and employment-related issues. The ‘client-focus’ principle forms part of the Banking Code and is regarded as a necessary precondition for the continuity of the undertaking. While, with respect to 2010, the Banking Code Monitoring Committee still reported that banks were wrestling with how to put the client-focus principle into practice and bring about the related changes in culture, later it sounded a more optimistic note. In its latest report (January 2017) it credits the sector for improving internal processes and listing themes such as the customers’ interests being central, and for having developed a ‘trust monitor’ that enables effective communication on progress relating to client focus towards society. Complementary to the new Banking Code, the Dutch Banking Association introduced a ‘social statute’ setting out the sector’s core values, a banking oath and disciplinary measures, in which the importance of client focus is stressed. Alongside the efforts of the sector itself, both the Dutch Central Bank and the AFM, within their respective areas of competence, continuously monitor progress on client focus and press for further change. According to the Corporate Governance Code the purpose of the remuneration structure should be to focus on long-term value creation for the company and its affiliated enterprise. The remuneration must ‘not encourage management board members to act in their own interests nor to take risks that are not in keeping with the strategy formulated and the risk appetite that has been established’.38 The Banking Code also contains a section on remuneration policy. Many of the detailed provisions regarding both fixed and variable remuneration components have been omitted in the latest version of both Codes. However, three important new provisions have been added to the new Corporate Governance Code to provide further substance to the guidelines regarding remuneration policy. Management board members must give the remuneration committee input regarding their own remuneration. In addition, the remuneration of supervisory board members must be in line with time spent. Finally, severance pay is limited to one year’s salary and may not be awarded if the management board member terminates the agreement early or is guilty of seriously culpable or negligent conduct. Both Codes, particularly the Corporate Governance Code, had extensive and complex remuneration provisions. Since various new pieces of legislation regarding remuneration have been introduced in the past few years, the monitoring committees of both Codes no longer saw the need for such detailed provisions in the Codes. In this regard, the legislator has adopted the former Banking Code standard in relation to the variable remuneration of management board members of banks (a maximum of 100 per cent of the fixed salary) and subjected it to stricter conditions: if breached, the rate of a newly introduced bank tax will be increased by 10 per cent.39 The Dutch government, moreover, introduced as of February 2015 a maximum variable remuneration within the whole of the financial sector of 20 per cent of the fixed salary.40 This regime was intended as a transitional arrangement awaiting implementation of the CRD IV Directive, in which as a rule bonuses are subject to a cap of 100 per cent of the fixed annual salary. As of 1 January 2016, the rules implementing CRD IV entered into force. For financial companies as well as Dutch public limited companies, legislation providing for the power to claw back bonuses from management board members entered into force on 1 January 2014.41 This power had already formed part of the codes of conduct, but its scope was narrower. The relevant Act was the subject of extensive parliamentary debate because of a controversial provision requiring listed companies, in merger and takeover situations, to deduct from a management board member’s salary any increase in the value of the company’s shares following the merger or takeover; a management board member with shares in the company is therefore precluded from profiting from the transaction. The – understandable – rationale behind this provision is to eliminate personal gain as the driving force behind the decision-making in such situations. This ‘skimming off’ rule expired, pursuant to a sunset clause, on 1 July 2017. Although the minister endorses the aim of the rules, he thinks they are too complex and should be replaced. To this end, he announced to draw up a draft bill for consultation purposes. One possibility is to give the supervisory board additional clawback powers in connection with major corporate events such as a takeover. The 2018 legislative programme (part of the state budget for 2018) includes a draft bill on this subject, with 1 January 2018 as the – now surpassed – planned effective date. The content of the new rules is unknown, but we expect them to grant the supervisory board a discretionary power as described above. Furthermore, ‘say on pay’ has been at issue, partly in the context of the revision of the Shareholders Directive (see Section V.i) and in part following the submission of a bill to introduce a say-on-pay right for the works council. Of course, although the discussion specifically focuses on remuneration, it is in fact a general behavioural and cultural change that is expected. Expectations are also high in politics in this respect concerning the moral and ethical declaration contained in the Banking Code enacted in early 2013. Initially, the oath concerned management board members and supervisory board members, but as of 1 April 2015 a larger group is subject to the oath by law. Another important shareholder right introduced in 2004 is the right to have items placed on the agenda of a general meeting.44 Originally the threshold was 1 per cent; with effect from 1 July 2013 it has been raised to 3 per cent. With the implementation of the first Shareholder Rights Directive45 in July 2010, this right has been strengthened. Until then, the company could refuse such a request on the basis of a compelling interest. The consequences in practice of the right to have an item placed on the agenda of a general meeting are discussed further in Section V.iv. At the European level as well, at the turn of the century the focus was on promoting greater shareholder participation in corporate governance. This was expressed in the first Shareholder Rights Directive, which grants shareholders in listed companies various rights aimed at facilitating voting (including cross-border), such as e-voting and proxy voting, which under Dutch law mostly existed already. The Directive also provides for the system – meanwhile mandatory in listed companies46 – of record dates, under which only shareholders registered on a particular date (approximately four weeks) before the general meeting are entitled to vote at that meeting. Most importantly, the introduction of a record date eliminates the need for share blocking, which discourages institutional investors from voting because it requires them to suspend their investment activity in respect of the blocked shares during the relevant period. As Eumedion, the interest group representing institutional investors, already concluded, this in connection with the extended period for convening general meetings of shareholders (42 days) seems to have contributed to increased shareholder participation. On 20 May 2017, the revised Shareholders’ Rights Directive entered into force.47 Some of the rules are new to the Netherlands; others already apply under Dutch law, although these are generally the ones that have attracted the most media attention. For example, listed companies throughout the EU will have the right to identify their shareholders; in the Netherlands this is possible under the Securities Book-Entry Transfers Act.48 Similarly, the ‘new’ right for shareholders to vote on the remuneration policy is already laid down in Section 2:135(1) of the Dutch Civil Code. Specific objectives of the revised Directive are to (1) increase the level and quality of engagement of asset owners and asset managers with their investee companies; (2) create a better link between pay and performance of company directors; (3) enhance transparency and shareholder oversight on related-party transactions; (4) ensure reliability and quality of advice of proxy advisers; and (5) facilitate transmission of cross-border information (including voting) across the investment chain in particular through shareholder identification. The deadline for EU Member States to implement the Directive in national law is 10 June 2019, so a draft bill is to be expected in 2018. The most fundamental right of a shareholder is the right to vote at meetings. In principle, Dutch corporate law adheres to the principle of equality of voting rights: all shares carry equal rights and obligations in proportion to their nominal value and all shareholders whose circumstances are equal must be treated in the same manner.49 The articles of association may, however, provide otherwise. The principle of one share, one vote also applies.50 There are, however, important exceptions to these principles, a few of which are mentioned below. The first exception is the use of ‘loyalty shares’, to which extra voting rights or extra dividends are attached as a reward for long-term shareholders. The Supreme Court has held that the distribution of loyalty dividends is permitted.51 In the political arena, there have been various calls for the enactment of statutory rules on loyalty shares. In 2012, after consulting with experts and interested parties, the government decided to refrain from proposing new legislation for the time being. It was concluded that the advantages of these shares are too uncertain and their limited marketability is a definite drawback. Legal commentators have also pointed out that a long-term shareholder is not necessarily an involved shareholder, participating actively in the company’s governance. Such a shareholder would nevertheless profit from the extra dividends or voting rights. An important merger for corporate practice of two companies (Fiat Industrial and CNH Global) into a Dutch NV indicates that the enactment of statutory rules on this issue is unnecessary. The Dutch NV introduced loyalty shares with extra voting rights, based on the French model. In the context of the phased IPO of the nationalised bank ABN-AMRO (November 2015) loyalty shares have been contemplated, but for a number of reasons, including the fact that this would have been the first IPO to include such shares, the government decided against it. A second exception to the principle of equality of voting rights is the issuance of protective preference shares: listed companies may protect themselves against hostile takeovers or shareholder activism by issuing preference shares to an independent foundation set up in advance for this purpose (see Section V.v). A third exception to the principle of equality of voting rights is financial preference shares, which are used as a financing instrument. In respect of these shares, too, there is a disproportionate relationship between the voting rights acquired and the capital invested. With respect to the issuance of financing preference shares, the Corporate Governance Code provides that the voting rights attached to such shares must be based on the fair value of the capital contribution.52 This represents an attempt to return to the one-share, one-vote principle. Under Dutch law, shareholders – unlike management and supervisory boards – are in principle not required to be guided by the interests of the company and its affiliated enterprise. Shareholders may, therefore, in principle give priority to their own interests, with due regard for the principles of reasonableness and fairness. Based on these principles, however, larger shareholders are considered to have a certain responsibility towards other parties. The Corporate Governance Code’s preamble states: ‘The greater the interest which the shareholder has in a company, the greater is his or her responsibility to the company, the minority shareholders and other stakeholders.’ Institutional investors in particular are therefore being called upon to accept greater responsibility. In this regard, the Corporate Governance Code seeks to increase the transparency of voting behaviour. Institutional investors must publish their voting policy on their website and report annually on how that policy has been executed in the preceding year. They must also report quarterly to the general meeting of shareholders on how they have exercised their voting rights.53 Furthermore, Eumedion adopted a set of ‘Best Practices for Engaged Share-ownership’ in June 2011, which, inter alia, call on institutional investors to inform clients of conflicts of interest if, in relation to a particular matter, the investors have divergent roles that could affect their voting behaviour. According to its latest monitoring report regarding compliance with the best practices (December 2016), the concept of responsible and engaged share ownership has become common practice. A large majority of institutional investors applies a voting and engagement policy and reports on this (93 per cent). Compliance with the best practice of identifying conflicts of interest is improving (from 41 per cent in 2013 to 70 per cent). At the European level, similar developments are taking place. In late December 2012, the European Commission adopted the Corporate Governance Action Plan, containing various initiatives to increase the engagement of shareholders with the corporate governance of undertakings. In this regard, the ESMA updated its guidelines in 2014 on ‘acting in concert’ in the Directive on Takeover Bids (see Section V.v).54 In addition, the European Commission is of the opinion that institutional investors should be more transparent about their voting policies, as this would lead to better investment decisions and could also facilitate dialogue with the relevant company. In this context, the unclear role of proxy advisers is seen as a problem area. These issues are dealt with in the proposed revision of the Shareholders Directive (see Section V.i). In practice, the shareholder rights described in Section V.i, above, have also been actively exercised by hedge funds, most notably the right to have an item placed on the agenda of a general meeting.55 Although the aim of the new rights was to increase shareholder participation and strengthen the monitoring of management boards, the actions of hedge funds have also revealed a dark side to participation. In particular, the focus on short-term profits has had adverse effects in some cases. The notable example of this was the role of hedge fund the Children’s Investment Fund (TCI) in the acquisition of ABN-AMRO – one of the largest banks in the Netherlands (2007). TCI, which held only about 2 per cent of the shares, pressed the ABN-AMRO management to sell all or part of the bank and distribute the proceeds as a bonus dividend. TCI managed to have this proposal placed on the agenda of the general meeting and it was ultimately adopted. In the end, this led to the acquisition of ABN-AMRO by three foreign banks. This transaction in connection with a number of situations in which activist investors targeted companies with similar proposals caused both government and parliament to reconsider the desirability of shareholder activism. In May 2007, the Corporate Governance Code Monitoring Committee recommended certain legislative changes intended to counteract the short-term orientation of activist shareholders. To achieve a sustainable relationship between a company and its shareholders the Monitoring Committee felt that shareholder conduct ought to become more transparent and dialogue between the parties ought to be encouraged. The Corporate Governance Act, which entered into force on 1 July 2013, reflects this train of thought. The idea behind the Act is to enable the management board, through the introduction of disclosure obligations, to learn the identity and intentions of its shareholders at an early stage, so that it can enter into a dialogue with them. The minimum threshold for the obligation to disclose substantial holdings of capital or voting rights in listed companies has therefore been reduced from 5 per cent to 3 per cent.56 In addition, the threshold for the right of shareholders to have items placed on the agenda for a general meeting has been substantially raised, from a capital interest of 1 per cent to a capital interest of 3 per cent; the alternative threshold in the case of an interest of €50 million for listed companies has been cancelled. Finally, the Act contains a mechanism enabling a listed company to identify its ‘ultimate investors’. The issues of empty voting or securities lending, both of which have appeared to be important instruments for activists, have not been directly provided for in the Act. Hedge funds can use these devices to influence decision-making in the general meeting of shareholders, without bearing any economic risk. The system of record dates provided for in the Shareholder Rights Directive (see Section V.i) is intended to discourage this practice. Furthermore, shareholders of listed companies are not only obliged to disclose their long positions in excess of a certain threshold, but also their gross short positions (see Section III) and should, when exercising the right to place an item on the agenda disclose their full economic interests (both long and short). As a result, the shareholder’s true motives for placing an item on the agenda should be revealed, which is supposed to discourage the practice of empty voting as well. In limiting the right to have items placed on the agenda the Corporate Governance Code goes further than the Act.57 The Code provides that a shareholder of a listed company may exercise this right only after having consulted the management board about this. If the item to be placed on the agenda may possibly result in a change in the company’s strategy, the management board must be given a period of a maximum of 180 days to respond (the response time). The management board should use this period to confer with the relevant shareholder. The statutory period for such requests, however, is 60 days before the meeting – even for items relating to the company’s strategy – and may, therefore, clash with the response time. A couple of years ago the Enterprise Chamber issued an important ruling on the relationship between the code provision and the statutory provision. The court held that the response time is an elaboration of the statutory principles of reasonableness and fairness that shareholders are required to adhere to in their relations with the company, and must, therefore, be respected by an activist large shareholder.58 According to the court, the response time may only be disregarded on compelling grounds. listing of depositary receipts instead of shares. The most common takeover defence is the incorporation of a protective foundation with a call option to acquire preferred shares. The shares, which are issued when a threat materialises, change the balance of control within the general meeting of shareholders and make it possible to pass certain resolutions desired by management or in some cases block certain undesired resolutions. Because preference shares are purchased for an amount less than their real value, the foundation acquires substantial control for little invested capital. The Supreme Court permits the issuance of protective preference shares provided they are necessary with a view to the continuity of the enterprise, and are adequate and proportional. The construction must be temporary in nature and intended to promote further dialogue.61 In the autumn of 2013, the Dutch telecom company KPN successfully staved off a hostile takeover bid by the Mexican company América Móvil with the help of such a foundation. In the wake of the bid, politicians again considered the question of whether the Netherlands is not too liberal and whether there should not be more possibilities for government intervention in takeovers of companies that serve a strategic public interest. A draft bill introducing the requirement for a declaration of non-objection for takeovers in the (vital) telecom sector was presented for online consultation in February 2017. Meanwhile, researchers of the Research and Documentation Centre of the Ministry of Justice investigated the way shareholdership, whether or not foreign, may have national security implications. In their research report of April 2017, they advocate a sector-specific check, such as currently exists for the energy and financial sector and which is also proposed in the present draft bill regarding the telecoms sector. In this regard there has also been a new European development. In September 2017, the European Commission published a proposal for a Regulation establishing a framework for screening of foreign direct investments into the European Union, while allowing Member States to take into account their individual situations and national circumstances.62 The Dutch government aspires to maintain an open investment environment and suspects the proposal to interfere with this objective. They believe the proposal goes beyond what is necessary and that guidelines would be more suitable than a regulation. As mentioned earlier, the coalition agreement of 2017 states that a listed company that faces proposals during a general meeting of shareholders for a fundamental change of strategy, will be able to invoke a response time (a time-out) of up to 250 days (see Section I.ii). Later on, the Minister of Economic Affairs and Climate Policy indicated that this time out could also be invoked in the event of a takeover bid. A draft bill regarding the protection of businesses is planned in the first quarter of 2018. As mentioned before, Dutch law accepts a number of deviations from the one-share-one-vote principle (Section V.ii). Instruments that are typically used as a defensive tool are dual-class structures, ownership limitations and – to a lesser extent – loyalty shares. The listing of depositary receipts instead of the shares themselves is not allowed as a defensive measure under the Corporate Governance Code63 and its use by listed companies is slowly declining; it is expected that the relisting of ABN-AMRO (see above), where the government opted for this form of protection mainly because of the complications connected with the more customary preference shares structure will remain an exception. White-knight defences only occur occasionally in the Netherlands, probably because of the availability of preferable alternatives. Directors are typically appointed and re-appointed on the basis of a rotation scheme, as required under the Corporate Governance Code.64 The concept of staggered boards, as far as we are aware, is not applied by Dutch listed companies. To avoid confrontations with the general meeting of shareholders, management boards may try to align corporate policy somewhat with the desires of shareholders and to seek out their opinions in advance. Although the general meeting of shareholders has a statutory right to obtain information, based on which it is accepted that shareholders have the right to ask questions at a general meeting, it is unclear from the relevant DCC provisions whether the management board can itself take the initiative to discuss its intentions with individual shareholders outside a meeting. In practice, such one-on-one meetings do take place. According to best practice provision 4.2.2 of the Corporate Governance Code, the company should formulate a policy on bilateral contacts with shareholders and publish this policy on its website. It is important that particular shareholders are not favoured and given more information than others, however, as this would violate the principle that shareholders in the same circumstances must be treated equally. It goes without saying that price-sensitive information may not be disclosed. The fear of violating the market abuse rules causes some shareholders and companies to be hesitant about participating in one-on-ones. Shareholders among themselves may, in addition, be afraid of being regarded as parties ‘acting in concert’, because under the provisions of the Directive on Takeover Bids65 such parties are obliged to make an offer for the listed shares of a company if they collectively acquire dominant control (30 per cent or more of the voting rights in that company’s general meeting of shareholders). What exactly is meant by ‘acting in concert’ is not very clear in practice and may represent an obstacle in the path of cooperation among shareholders. For this reason, at the end of 2013 the European securities markets regulator ESMA drew up a white list of activities on which shareholders can cooperate without being presumed to be acting in concert, and which was updated in 2014. However, if shareholders engaging in an activity on the white list in fact turn out to be cooperating with the aim of acquiring control over the company, they will be regarded as persons acting in concert and may have to make a mandatory bid. The sensitive subject of cooperation with regard to board appointments has been acknowledged, but was nevertheless left off the white list. Several legislative plans are currently at the forefront of corporate governance in the Netherlands, some of which originated from before 2017. Owing to the lengthy formation of the cabinet in 2017, many of these plans got delayed last year. For example, a proposal for new legislation regarding partnerships was initially announced to be presented in 2017, but has not been published yet. Other bills containing corporate legislation have been at a standstill in 2017. Looking at the 2018 legislative programme and the new coalition agreement, modernisation and simplification of regulations is still key for 2018. Besides the modernisation of partnership legislation, which will supposedly enter into effect in 2019 according to the 2018 legislative programme, the new cabinet also plans to reduce the administrative burden on business, especially for small and medium-sized enterprises. This is in line with the 2015 European capital markets union action plan. Transparency and the prevention of malpractice also remains high on the corporate agenda. Regarding transparency, the aforementioned register for beneficial owners, the (less accessible) central register for shareholders of Dutch public listed companies and limited companies, and the dematerialisation of bearer shares (which was supposed to enter into effect on 1 January 2018) are still scheduled to enter into effect in the short term. Additionally, many, mainly large companies will face new rules on integrated reporting in 2018. First, Directive 2014/95/EU66 requires public-interest entities – in short listed companies, banks and insurers – qualifying as ‘large’ and having an average of more than 500 employees, to include in their management reports a non-financial statement containing certain CSR-related information. Entities subject to the disclosure requirement must include in their management reports a separate statement explaining the policies they pursue in relation to environmental, social and employee matters, respect for human rights and anti-corruption and bribery matters and the results of those policies. The Directive also requires large listed companies to include in their management reports a description of the diversity policy in relation to their management and supervisory boards. The description must be incorporated in the company’s corporate governance statement (which is already mandatory for such companies) and must relate to aspects such as age, gender and educational/professional background. Furthermore, the Corporate Governance Code also prescribes new (non-financial) transparency obligations that companies have to comply with in 2018 for the first time. With regard to the prevention of malpractice, the Management and Supervision (Legal Entities) Bill is still before the lower house of Parliament, although it was planned to enter into effect on 1 January 2018. The bill’s purpose, in brief, is to harmonise a number of rules for all of the different types of legal entities so that they are in line with the rules currently applicable to private and public limited liability companies (BVs and NVs). This is to further strengthen public-sector governance. The bill implements most of the recommendations of the Commissie Behoorlijk Bestuur (Good Governance Committee), chaired by former MP Femke Halsema. The committee was set up following several high-profile public-sector management scandals. In the same context of strengthening the governance of a specific sector, the Additional Measures Audit Firms Bill is currently before the upper house of Parliament. The bill aims to introduce new measures for improving the quality of statutory audits and to strengthen the role of the regulatory authority (AFM). The planned effective date is 1 July 2018. As mentioned before, new legislation is also on the horizon regarding additional scrutiny of takeovers of companies operating in vital sectors and regarding protection against improper shareholder activism and hostile or risky, or both, takeovers (Sections I.ii and V.v). The protection against shareholder activism stems from the ongoing discussion concerning the position of shareholders, which has previously led to the revised Shareholders’ Rights Directive. Although the 2016 Corporate Governance Code requires companies to pay more attention to long-term value creation, with the new Code no material changes were made to alter the position of shareholders. With the implementation of the revised Shareholders’ Rights Directive and the proposed legislation regarding improper shareholder activism, the discussion about the position of shareholders will continue in 2018. With this in mind, it seems fair to say that corporate governance is a hot topic in the Netherlands. The goal remains to create a proper balance between the interests of the various stakeholders within an enterprise, without losing sight of the interests of society as a whole. In the end, a model will have to be found whereby risky conduct is discouraged and public confidence in the management boards of banks and companies is restored. 1 Geert Raaijmakers is partner and Suzanne Rutten is professional support lawyer at NautaDutilh NV. 2 SNS Reaal, 4 November 2016. 3 Book 2, Title 4, Part 6 of the DCC. 4 See Rients Abma (in Dutch), ‘Naar de one-tier board’, Goed Bestuur, 2012/3. 5 Willem J L Calkoen, ‘The One-Tier Board in the Changing and Converging World of Corporate Governance’, dissertation, Rotterdam, 2011, p. 305. 6 Article 2:129 of the DCC. 7 Article 2:140(2) of the DCC. 8 Article 2:164 of the DCC. 9 As a result of recently adopted EU legislation the responsibilities of the audit committee will increase in the future; see Section III.ii. 10 Unidek, 15 April 2005. 11 Best Practice 3.2.3 of the Corporate Governance Code 2016. 12 Article 2:158 of the DCC. 13 Article 2:161 of the DCC. 14 Stork, 17 January 2007. 15 Principle 2.1 of the Corporate Governance Code 2016. 16 Named after the chairperson, Professor Annetje Ottow. The Committee also comprised Professor Janka Stoker and Jan Hommen. 17 This detailed letter can be found on www.dnb.nl (in Dutch only). 18 Report on the peer review of the ‘Guidelines on the assessment of the suitability of members of the management body and key function holders’ (EBA/GL/2012/06) of 16 June 2015. 19 Best Practice 2.4.2 of the Corporate Governance Code 2016. 20 Directive 2013/36/EU of the European Parliament and of the Council of 26 June 2013 on access to the activity of credit institutions and the prudential supervision of credit institutions and investment firms. 21 Act of 25 June 2014 implementing capital requirement directive and regulation (Bulletin of Acts and Decrees 2014, 253). 22 Proposal for a Directive of the European Parliament and of the Council on improving the gender balance among non-executive directors of companies listed on stock exchanges and related measures (COM (2012) 614). 23 Directive 2014/95 of the European Parliament and of the Council of 22 October 2014 amending Directive 2013/34/EU as regards disclosure of non-financial and diversity information by certain large undertakings and groups. 24 Directive 2014/95/EU amending Directive 2013/34/EU as regards disclosure of non-financial and diversity information by certain large undertakings and groups. 25 Article 2:130 of the DCC. 26 Fairstar, 30 September 2015. 27 Poot-ABP, 2 December 1994. 29 Landis, 19 June 2013,Van der Moolen, 15 February 2013 and Meavita, November 2015. 30 Resort of the World/Maple Leaf, 7 October 2016. 31 Section 17 Regulation 596/2014 of 16 April 2014 on market abuse (market abuse regulation) and repealing Directive 2003/6/EC of the European Parliament and of the Council and Commission Directives 2003/124/EC, 2003/125/EC and 004/72/EC (MAR). 33 Section 5:25c et seq. of the FSA. 34 Section 5:38-44 of the FSA. The Netherlands used the Member State option to maintain a lower threshold (3 per cent as opposed to 5 per cent in the Directive), see the previous footnote. 35 The absence of any economic interest with the party legally entitled to exercise the voting right at the general meeting of shareholders. 36 Audit Firms (Supervision) Decree. 37 Best Practice 1.1.1 of the Corporate Governance Code 2016. 38 Principle 3.1 of the Corporate Governance Code 2016. 39 Banking Tax Act (Bulletin of Acts and Decrees 2012, 325); the Act entered into force on 1 October 2012. 40 Bulletin of Acts and Decrees 2015, 45. 41 The Clawback Act (Bulletin of Acts and Decrees 2013, 563). 42 Article 2:107a of the DCC. 43 ABN-AMRO, 13 July 2007. 44 Article 2:114a of the DCC was introduced by means of the Corporate Governance Act; see Section V.iv. 46 Article 2:119(2) of the DCC. 47 Directive (EU) 2017/828 of the European Parliament and of the Council of 17 May 2017 amending Directive 2007/36/EC as regards the encouragement of long-term shareholder engagement. 49 Article 2:92 of the DCC. 50 Article 2:118(2) of the DCC. 51 DSM, 14 December 2007. 52 Best Practice 4.3.4 of the Corporate Governance Code 2016. 53 Best Practice 4.3.6 of the Corporate Governance Code 2016. 54 This statement was updated in June 2014. 55 To put things into perspective: Eumedion estimates that in the Netherlands between 2005 and 2011 in total 40 shareholder proposals (not just hedge funds) were submitted, against around 7,500 management proposals. 57 Best Practices 4.1.5 and 4.1.6 of the Corporate Governance Code 2016. 58 Cryo-Save, 6 September 2013. 59 ASMI, 9 July 2010. 60 Boskalis/Fugro, 12 January 2018. 61 RNA, 18 April 2003. 62 Proposal for a regulation of the European Parliament and of the Council establishing a framework for screening of foreign direct investments into the European Union, COM(2017) 487 final. 63 Principle 4.4 of the Corporate Governance Code 2016. 64 Best Practice 2.2.4 of the Corporate Governance Code 2016. 66 EU Directive 2014/95/EU on the disclosure of non-financial information by certain large public-interest entities.